According to Baron Rothschild, the key to making money is to “buy when there’s blood in the streets.” This quote, and more importantly the concept of contrarian investing, has been immortalized by Warren Buffett and many investors following him. Well right now, there’s a whole lot of blood in the streets of the oil industry and Hornbeck Offshore Services (HOS, $19.58) is the best combination of downside protection and long-term upside I’ve seen. Hornbeck manages offshore vessels (OSVs) that supply drilling rigs. 75% of their revenue is domestic (primarily Gulf of Mexico) with the rest mostly in Mexico and Brazil. The beautiful thing about operating supply vessels in the Gulf of Mexico (GoM) is the Jones Act which creates a significant barrier to entry. Essentially, vessels that transport merchandise and passengers in US waters must be owned and managed by US citizens and the vessels must have been built in the US. Foreign vessels can’t just show up and start taking work away from Hornbeck and the other operators. This has obviously created an oligopoly in the GoM and Hornbeck is either the #1 or #2 vessel operator in the Gulf depending on how you measure. Another contributing factor to this great business is how easily it can scale up or down. When vessel demand is low (like right now) they cold stack vessels and get rid of the daily operating expenses. During 4Q14 and 1Q15 they stacked 12 vessels, reduced headcount and issued across-the-board pay cuts for shore-side employees. During the 2011 GoM drilling moratorium (due to the BP oil spill) Hornbeck suspended their 401k match to decrease costs. These decisions show management can act rationally to decrease costs and survive downturns. Tidewater (TDW), Seacor Holdings (CKH) and Gulfstream Offshore (GLF) are Hornbeck’s closest public competitors. None of these three companies are nearly as focused in the GoM as Hornbeck so comparisons may not be perfect, but it’s all we have. With that disclaimer out of the way, Hornbeck appears to be a very good operator. Over the past ten years, they have the highest gross margins, lowest SG&A margins, highest dayrates and second highest utilization of their peer group. They also have the youngest fleet of the group. Todd Hornbeck is the CEO and Chairman who co-founded the company in 1997. From 1991-1996 he worked at the original Hornbeck Offshore Services which his father founded, ran and then sold to Tidewater. His father, Larry Hornbeck, sits on the board and owns $6.3M worth of HOS stock. All directors own at least a couple hundred thousand worth of stock. Executive pay is a little higher than I like but I’ve seen much worse. In total, 2013 executive compensation was 7.5% of operating income. Much of this compensation is in bonuses that are based on Hornbeck’s performance vs their peer group (though the metrics are a little weak in my opinion). More importantly, Todd’s stock ownership is worth ~$17M or 3.7x his total 2013 income so our interests are aligned. Todd also purchased $400k of stock on the open market earlier this month at ~$19.05 which is always good to see. Overall, this is a management team that I am very confident in. Between Todd and Larry, they have a serious amount of experience and success in this industry. Being an entrepreneur myself, I have a certain affinity for companies that are still run by the founder(s). The entrepreneurs I know see their business as their baby and care for it more than any hired CEO ever could. I haven’t seen any examples in the company’s past of management taking advantage of shareholders. There’s no secret here: the #1 catalyst to move the stock price higher will be the price of oil increasing. I wish I had a special insight into when, or if, that will happen but I don’t. What I do know is that deepwater drilling isn’t going anywhere anytime soon and those drilling rigs need vessels to support them. In fact, GoM drilling keeps increasing with new deepwater discoveries being made nearly every year. Even better, these discoveries are getting deeper and deeper. This means more complexity, more materials needed and more travel time to and from the rig. Daily operating expenses for ships have also been increasing for at least the past 15 years. Management has guided 2015 daily opex in the ballpark of $15,000/ship. HOS and other vessel operators have to earn their opex + a reasonable rate of return which essentially puts a floor on dayrates. So dayrates may very well be pushed down in the short-term, but eventually costs are rising and dayrates will rise with them. The average dayrate of Hornbeck’s peer group has a CAGR of 10.6% from 2004-2013. Longer term, Brazil is an area to keep an eye on as they have one of the largest (and mostly untapped) deepwater reserves in the world. Unfortunately, Petrobas is the Brazilian operator there and has been a thorn in Hornbeck’s side. To read up on the interesting (i.e. value destroying) history of Petrobas, read Aswath Damodaran’s recent blog post. I don’t expect anything major here anytime soon, but the potential is there. The #1 concern most people would notice right off the bat is the amount of debt. As of 4Q14 they have $1.1B in debt and a net debt/EBITDA of 4.4. They started a large $1.27B newbuild program in 2011 which is coming to completion over the next two years. Their debt load has recently peaked and will be declining hereafter. The good news is none of this debt is due until 2019 and the biggest portion is due in 2021. Even in the absolute worst case (i.e. unrealistic) scenario I could come up with, HOS still generates enough EBITDA to handily cover interest payments for the next several years. If things somehow get worse than I imagine, they also have a $300M revolving credit facility (with a potential $200M expansion) that doesn’t mature until 2021 ($0 outstanding right now). While the price of oil as a risk should go without saying, something not so obvious is the supply/demand dynamics for supply vessels in the GoM. This is a risk that management has mentioned numerous times over the past year. At yearend 2015 there were 160 OSVs operating in the GoM against 44 working rigs for a ratio of 3.6:1. The problem is another 40 OSVs are expected by yearend 2015. Eight drilling rigs are on their way to the GoM in 2015, but offsetting that are nine current rigs that have contracts expiring. Management is assuming all nine of these rigs up and leave which seems overly conservative. Either way, while this is something to keep an eye on I’m not too concerned. Total OSV count in the GoM decreased significantly from 3Q14 to 4Q14 which suggests OSV operators are being rational and cold stacking during the downturn. Also, with Hornbeck’s ability to quickly scale up and down and their young fleet demanding the highest dayrates I think they’ll be alright. Hornbeck is currently selling for a price/book of around 0.5. With four new OSVs and one MPSV being delivered in 2015, plus their newly implemented share repurchase program, book value should be around $50 by year end, putting the price/book closer to 0.4. Put another way, if P/B stays constant at 0.5, HOS will be up 25% a year from now. Over the past ten years, HOS has sold for an average of 1.5x book while their peer group as a whole has averaged 1.2x book. In addition, the one OSV they sold in 4Q14 and the four they’re selling to the US Navy in 1Q15 are all for above book value. Now, I don’t necessarily think book value is the best way to value HOS, but having downside protection via assets is never a bad thing. Dayrate is the biggest variable I’m guessing at. $26,000 base case is the high end of their 2015 dayrate guidance. The $23,123 bad case is the deadweight ton-inflation-adjusted 2011 dayrate (when there was a 6-month moratorium on all GoM drilling). The worst case of $17,820 is daily opex + 10% which seems very unrealistic. Daily opex is also an educated guess. The middle of their 2015 opex guidance is ~$15,100. I multiplied this by the historical CAGR of their dayrate. All three utilization numbers are probably conservative. As HOS and others cold stack vessels, utilization increases (less ships available = higher % of those available are being utilized). 71.5% is their lowest utilization in over 15 years (from 2011). Their long-term guidance is 75-85% but this is based on a full fleet operating, not 12 vessels stacked. Management assumes zero share repurchases in their guidance which based on what they’ve said is not going to be the case. I assumed a slight share increase from YE2014 even though they have $125M left under their repurchase program (they used the first $25M during 4Q14). I also subtract out other (growth) capex when most investors would not. In my eyes the worst case scenario is wholly unrealistic, but it’s in there to show that even if the current situation gets much worse HOS can still cover their interest charges and survive. Assuming 10x cash flow, the bad case scenario would result in a CAGR of 5.7% and the base case would be 47.3%. 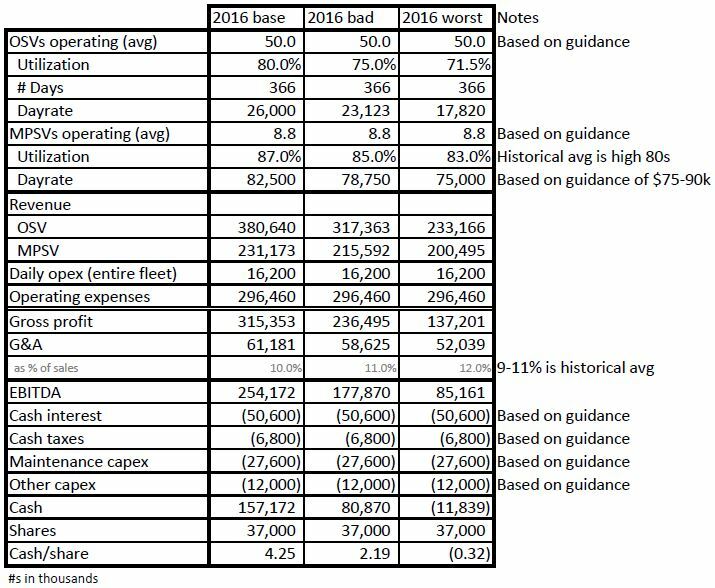 Keep in mind 2016 guidance isn’t even based on a full year of having their new fleet, 2017 will be the first year for that. I’m not one to try and put an exact price estimate on a stock. I think knowing when someone is fat is more valuable than knowing their weight. The combination of book value putting a floor on the stock price and their ability to generate over $2.00/sh in a sustained low oil environment protects my downside. If oil recovers or the supply/demand dynamics improve, HOS could be a multi-bagger.